Wind speeds in the United States have dropped fifteen to thirty percent over the course of the last thirty years. This finding will be published in a forthcoming issue of the Journal of Geophysical Research - Atmospheres. According to one of the authors, Eugene Takle, professor of atmospheric science at Iowa State University, "wind speeds generally across the country are declining, more so east of the Mississippi." This finding may or may not affect the wind-generated power industry. The wind velocities measured in the study were taken about 30 feet above ground; typical wind turbines are 250-400 feet tall. The authors cited as possible causes climate change, reforestation of the US (forest cover in the US grew at the fourth fastest rate in the world from 2000 to 2005) and changes in the type of instrumentation over the years. This is really a kind of anti-prediction, from the standpoint of this site. In 1961, J.G. 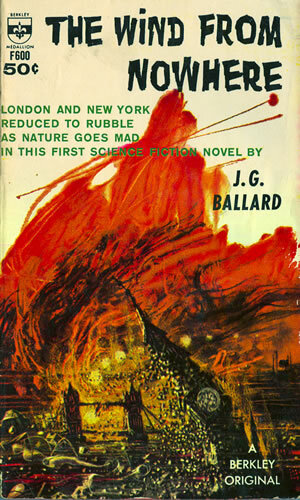 Ballard published his first novel The Wind From Nowhere, in which he posited the idea of an environmental disaster consisting of prolonged hurricane force winds. More recently, the 1994 novel Heavy Weather by Bruce Sterling made use of a similar idea, set in the United States.